As Burgoyne advanced through the wilderness, his front line was stirring up trouble. Marker for the Allen family massacre. The Murder of Miss Jane McCrea. Currier Ives print courtesy of Library of Congress. As Burgoyne pushed through the wilderness at the painfully slow rate of 1 mile a day, General Fraser and his Indian allies were spread out in front of the army. This was when Burgoyne most needed them. He would depend on them to serve as the eyes and the ears of his army, navigating the wilderness and eliminating his enemies wherever they were to be found. But by now, Burgoyne was realizing, too late, that the Loyalists who were supposed to have come to his aid by the hundreds had not appeared, and that his Native American allies were also undependable. 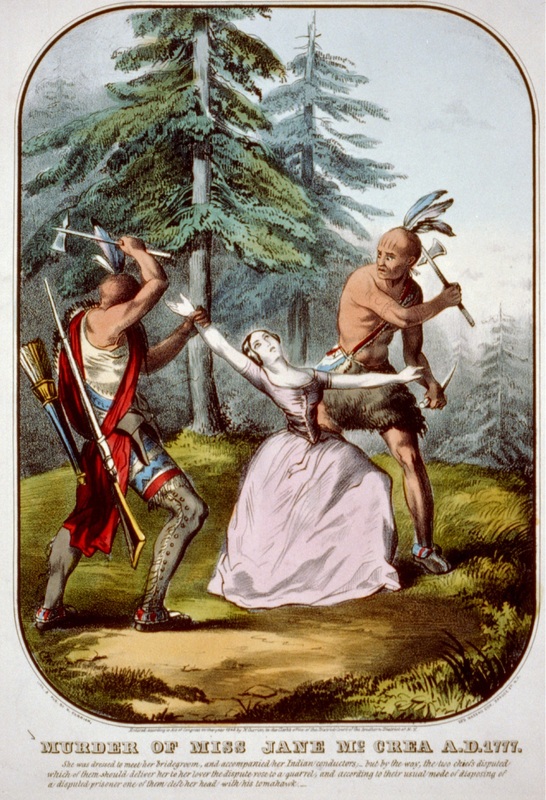 Stories began circulating of atrocities being committed by his Indian allies against the settlers. Whether true or not, these violent stories helped unite Americans against the British and their Native American allies. One such story was that of the Allen Family Massacre. Yerry Killmore sent his slave, along with their 12-year-old hand servant Sarah and their youngest daughter, to help the Allen family harvest the wheat. The following morning when the three had not returned, Killmore went to the Allen family homestead and found them all killed and scalped, presumably by Indians. The event caused great unrest in the local settlements. 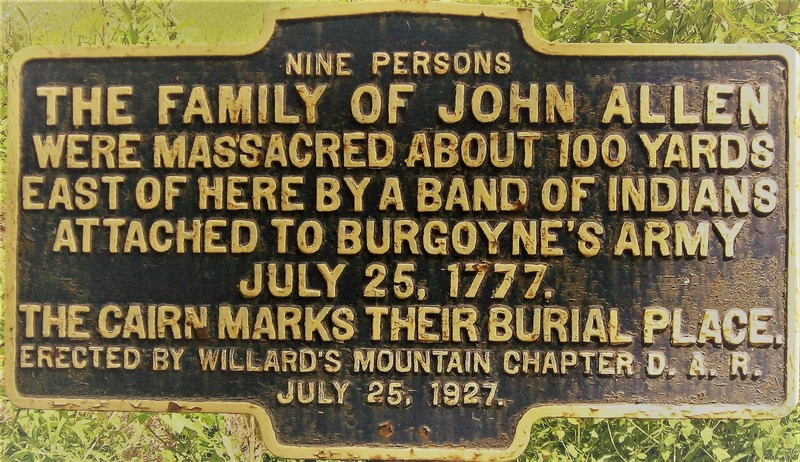 The Allen Family Massacre made it clear to the residents that they were not safe. While some did remain in their homes, others hid or took flight. This was the beginning of Burgoyne’s troubles with his Indian allies. Start Track 21 right after leaving Kingsbury Pocket Park.